Colours: red, green, buff, light grey, blue and dark grey.
" 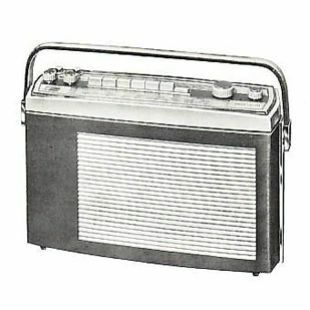 Beolit de Luxe FM (TR36), the sensational new Danish transistor radio. Housed in a beautiful rugged weather-resistant cabinet of impact proof leather grained polystyrene. It is available in the following elegant colours: red, green, buff, light grey, blue and dark grey. The battery, protected by a plastic case, is easily and quickly exchanged. Large B&O high quality loudspeaker assures superb tone quality. Beolit de Luxe FM (TR36) has unsurpassed dependability of operation, thanks to use of B&O printed circuit boards throughout and is well suited for use as a car radio. The Beolit de Luxe FM (TR36) has a built-in 'Radicator' (a small moving coil meter) that puts you in a position to check the condition of your battery at any time. The Radicator is also a tuning aid. The Beolit de Luxe FM (TR36) may be used for direction finding. "